The exhibition shows how internationally renowned artists have been exploring the impact of smell and are stretching the boundaries of ‘visual’ art. Themes include identity, memory and mapping. Birthe Leemeijer for example, reconstructed the smell of a typical Dutch landscape- the ‘polder’- which is bound to become part of our lost ‘volatile heritage’. Gayil Nalls made it possible to experience the entire world through one inhalation with her ‘World Sensorium’. And Sue Corke and Hagen Betzwieser even created the smell of the moon. Surprisingly olfactory art is not only a topic for today’s artists. Already a century ago Futurists and Surrealists such as F.T. Marinetti and Marcel Duchamp were adding olfactory layers to their sculptures, exhibition spaces and poetry recitals. 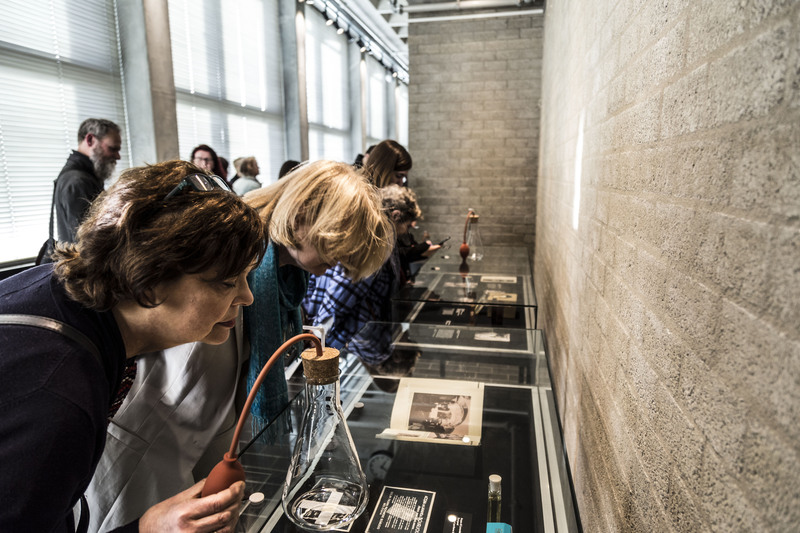 These lost smells and more works of art will be on view and sniff in the exhibition space at Vrije Universiteit Amsterdam. This project is a collaboration between Caro Verbeek – embedded researcher at the faculty of Humanities Vrije Universiteit Amsterdam, Wende Wallert – art curator of the University Library (UL) Vrije Universiteit Amsterdam, CLUE+, Graduate School, International Flavors & Fragrances and NWO. The symposium and workshops are fully booked, but the exhibition is on view and freely available for everyone during opening hours. That, however, is subject to other activities and purposes (such as promotions and festivities) that might partially block the accessibility of the show.